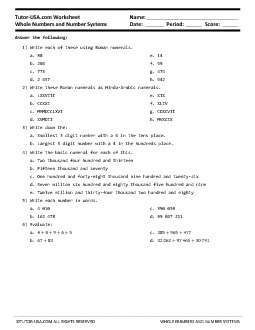 This free math worksheet contains problems on whole numbers and the number system. Students must write numbers in roman numerals, write numbers in arabic numerals, identify place values, write numbers in words, and number from words, and evaluate numerical expressions. To write numbers as roman numerals, arabic numbers, to identify place value, and write numbers in words. 1) Write each of these using Roman numerals. 2) Write these Roman numerals as Hindu-Arabic numerals. a. Smallest 3 digit number with a 6 in the tens place. b. Largest 3 digit number with a 4 in the hundreds place. 4) Write the basic numeral for each of this. 5) Write each number in words.